Brigadier General Harvey Curtis Tschirgi, former Assistant Chief of Staff, G-4, Headquarters Marine Corps, Washington, D. C., retired from active duty, November 1, 1961. The general was born April 20, 1908, at Grundy Center, Iowa, and graduated from high school there in 1925. He began his military career with an 18-month tour of duty in the Navy as an enlisted man, and in 1928 entered the U. S. Naval Academy. Upon graduation, he was commissioned a Marine second lieutenant, June 2, 1932, and assigned to Basic School at Philadelphia, Pennsylvania. In July 1933, General Tschirgi reported to the Marine Corps Base, San Diego, California. The following April he was assigned sea duty aboard the USS TENNESSEE. In July 1934, he returned to the Naval Academy where he served as a physical training instructor prior to joining the Fourth Marines in Shanghai, China, in January 1935. While in China, he was promoted to first lieutenant in August 1935. Shortly after his return to the United States in June 1937, Lieutenant Tschirgi was named Aide-de-Camp to the Commanding General, 2d Marine Brigade, Fleet Marine Force, at San Diego, California. His duties took him to China and back again to San Diego where, in July 1938, he joined the Sixth Marine Regiment. He was promoted to captain in September 1938. In June 1939, Captain Tschirgi was assigned duty with the Marine Detachment at the New York World's Fair. Upon his detachment in October 1940, he reported to the Marine Corps Base, Quantico, Virginia, as Adjutant of the Reserve Training Center. The following March, he began 18 months' sea duty aboard the USS NORTH CAROLINA, as Commanding Officer of the Marine Detachment. He was promoted to major in May 1942. In August 1942, Major Tschirgi entered the Infantry School at Fort Benning, Georgia. After completing the Battalion Commander and Staff Officer Course in November, he returned to Quantico, where he was an instructor in the Tactical Section and, later, Executive Officer of the Reserve Officers School. In March 1943, he was promoted to lieutenant colonel. In July 1944, after departing Quantico, Lieutenant Colonel Tschirgi joined the 1st Marine Division, then preparing for invasion of Peleliu. As Assistant Chief of Staff (Supply) during this campaign, he was awarded the Bronze Star Medal f meritorious achievement during the period September 15 to October 20, 1944. Subsequently, for meritorious conduct prior to and during the 0kinawa campaign, he was awarded his first Legion of Merit with Combat "V", during the period November 1944 to June 1945. In September 1945, Lieutenant Colonel Tschirgi embarked for China, serving at Tientsin as Assistant Chief of Staff, G-4, until his return to the United States in June 1946. That August he assumed duty at Headquarters Marine Corps, Washington, D. C., as Executive Officer, G-4 Section, Division of Plans and Policies. In June 1949, he was assigned for two years to the staff of the Logistics Department, Naval War College, Newport, Rhode Island. While there he was promoted to colonel in August 1949. 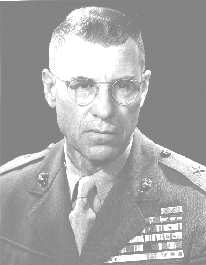 Colonel Tschirgi returned to Quantico in July 1951 to serve as Deputy President of the Marine Corps Equipment Board, Landing Force Development Center, until embarking for Korea the following October. He joined the 1st Marine Division in Korea in November 1952, serving as Commanding Officer, Kimpo Provisional Regiment, until April 1953; and as Regimental Commander, Fifth Marines, until August 1953. For meritorious service during this period, he was awarded his second Legion of Merit with Combat "V". Shortly after his return to the United States, Colonel Tschirgi assumed duty as a member of the Long-Range Team, Joint Logistics Plans Group, Office of the Joint Chiefs of Staff, Washington, D. C. He served in this capacity from September 1953 to May 1956, prior to a brief assignment as Chief of Staff, Marine Corps Recruit Depot, Parris Island, South Carolina. In November 1956, General Tschirgi was promoted to his present rank of brigadier general and named Assistant Division Commander, 1st Marine Division (Reinforced), Camp Pendleton, California. Following this assignment, in July 1958 he became Commanding General of the Landing Force Training Unit, Amphibious Training Command, Pacific Fleet, Coronado, California. He served in this capacity until November 1959, then assumed his final assignment at Headquarters Marine Corps, serving as Assistant Chief of Staff, G-4, until his retirement on November 1, 1961. A complete list of the general's medals and decorations includes: the Legion of Merit with Combat "V" and Gold Star in lieu of a second award, the Bronze Star Medal with Combat "V", the Presidential Unit Citation with one bronze star indicative of a second award, the Navy Unit Commendation with two bronze stars indicative of second and third awards, the American Defense Service Medal with Fleet clasp, the China Service Medal, the American Campaign Medal, the Asiatic-Pacific Campaign Medal with two bronze stars, the World War II Victory Medal, the National Defense Service Medal, the Korean Service Medal with three bronze stars, the United Nations Service Medal, the Korean Presidential Unit Citation, the Special Breast Order of Cloud and Banner (China), and the Collar Order of Cloud and Banner (China). 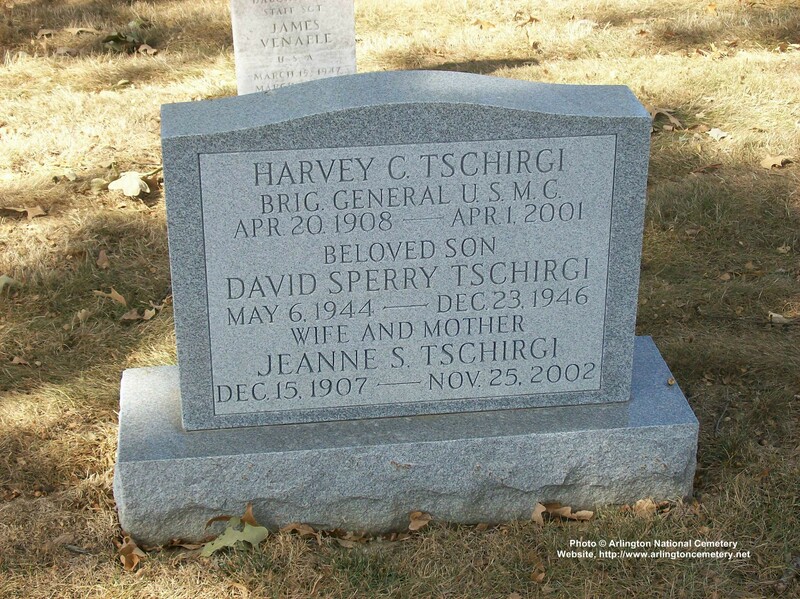 General Tschirgi is married to the former Jeanne H. Sperry of Grundy Center, Iowa. They have two daughters, Mrs. Susan T. King, and Sheila. Brigadier General Harvey C. Tschirgi, United States Marine Corp (Ret. ), 92, passed away April 1, 2000. He was a resident of El Paso for 11 years and was a graduate of the United States Naval Academy, Class of 1932. Susan T. King — four grandchildren and three great-grandchildren. Interment was at Arlington National Cemetery. Army grabbed a 10-0 halftime lead it would never surrender in besting Navy in Yankee Stadium once again. The Midshipmen closed to within 10-7 on a 55-yard touchdown pass from Lou Kirn to Harvey Tschirgi, but Ed Herb scored his second rushing touchdown of the day to seal the win.